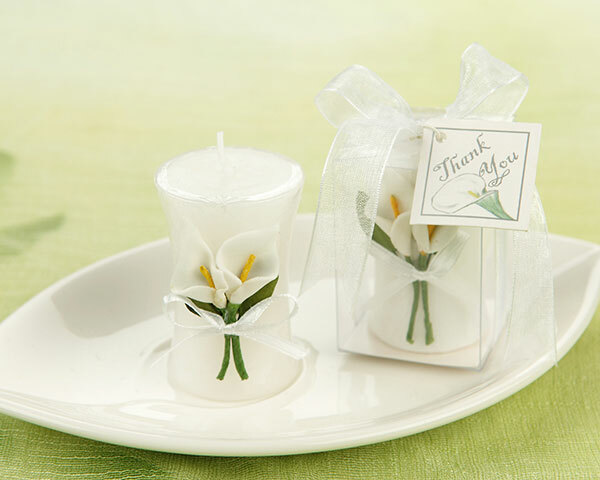 'Calla Lily Elegance' Vase Shaped Candle - EconoBride - Budget friendly wedding favors. A study in sophistication. This small candle elevates favors from a small token of appreciation, to a truly elegant addition to your reception d�cor. A lovely vaselike profile is just one of the unique aspects of this little candle. Handrolled fabric lily is tied with miniature silken ribbon, presenting a tiny and perfect bouquet. The candle arrives in a completely transparent box, showcasing it from all angles which is then tied with a sheer white ribbon and attached Calla-themed �Thank You� tag. Box measures approximately 1.75 inches wide by 2.5 inches tall. This product was added to our catalog on Sunday 08 August, 2010.